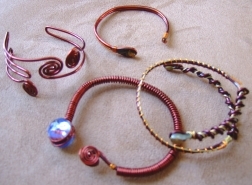 These bracelets are structures based on the spiral and the use of metals, colors, inks and minerals. They are able to host intelligent energies that are living life forms that act as intermediaries between planes of existence. The Selfic Bracelets attract energies for the development of personal potential and physical life. Come in to Roots & Wings and see the various ones we have for sale. These descriptions are just some of what we have available for you. of the Self is to reinforce the aura or personal energy field. It can be worn on either wrist and is useful for those who spend many hours in contact with others or who work in crowded environments. This bracelet concentrates vital energies throughout the aura of the person, protecting against the effects of radioactivity, magnetic fields, static electricity and fields created by computers and mobile phones. It is useful in cases of stress, helping to prevent ulcers and hypertension. It must be worn for at least six hours a day, preferably on the right wrist. Facilitates the harmonious manifestation of all the different parts of the wearer's psyche, creating the ideal conditions for personal expression in a complete, harmonious and balanced way. It can be worn continuously day and night. Stimulates the immune system so that the body can react quickly. Useful for strengthening the body's defences from an energetic point of view. It is particularly useful a the change of the season and very useful for those who travel frequently and wish to alleviate the effects of jet lag. Helps the recovery of vital energy during sleep. It deepens the level of sleep so that after only four or five hours of sleeping the wearer feels refreshed and recharged. Very effective in cases of chronic tiredness and overwork. The bracelet must be worn for a maximum of two or three nights a week. Encourages good blood circulation in the lower limbs, alleviating heaviness and stiffness in the legs. Helps to lesson swelling and tones up the lower limbs. To be worn on the ankle: can be worn both day and night. See the Damanhur website...learn from them more about these bracelets. See our schedule to learn when we are hosting visitors from Damanhur again. They bring along more bracelets and can explain further about what makes them special.